You can find an update of our schedule of Boat Dives and their status is below. Please note that deposits are NON-REFUNDABLE. If spaces are not all taken two months before the trip date we will open the trip up to our friends from other Branches/Clubs. Boat dives are suitable for Sport Diver and above. 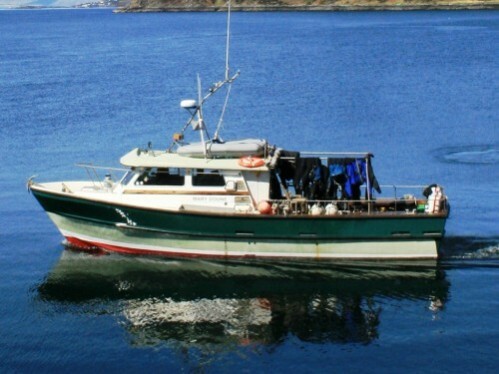 Fantastic weekends diving from the MV Mary Doune based in Doune bay, Knoydart. 2 Days diving with 2 nights accommodation, 2 breakfasts and Saturday evening meal. Enjoy the best that the West Coast and small islands have to offer. 1 Days diving around St Abbs head with Barry White aboard the MV Stingray. Great East Coast diving and very knowledgeable skipper to guide the group. All boat trips will be advertised for a period of 4 weeks before booking will take place. Once booking has opened, places will be allocated on a first-come first-served basis. To book a place you must speak to the treasurer in person and pay a deposit. This can be done by cash or by bank-transfer (BACS).